"This is a simple fajita marinade that has been bounced around in my family for at least 15 years. It's simple, tasty, easily altered for a twist on the taste, and can be easily prepared in under 15 minutes. Serve with other fajita elements and enjoy! Some ideas: sauteed green bell pepper with white or yellow onions, jalapeno slaw, homemade salsa (tomato or mango), etc." Whisk vegetable oil, chili powder, lime juice, honey, garlic powder, paprika, and black pepper in a bowl to make a marinade. Place chicken strips into a large resealable plastic bag; pour marinade over chicken. Knead bag to coat chicken with marinade. Squeeze out air, seal bag, and refrigerate 4 hours to overnight. Remove chicken strips from marinade; discard used marinade. Grill chicken on preheated grill until browned, the juices run clear, and an instant-read meat thermometer inserted into the thickest piece reads at least 160 degrees F (70 degrees C), about 10 minutes per side. Feel free to experiment with other spices, the amount of lime juice and honey, and the type of garlic. Minced garlic can be used instead of garlic powder, and tossing in 1/2 teaspoon of cayenne pepper can put an extra kick in the flavor. Followed the original recipe to the letter and I was not impressed. Yuck. This was a great recipe! I changed things up a bit and used fresh squeezed lemon, added hot pepper flakes, and a little Sriracha. Excellent! Will be using again and again! My whole family enjoyed the fajitas. 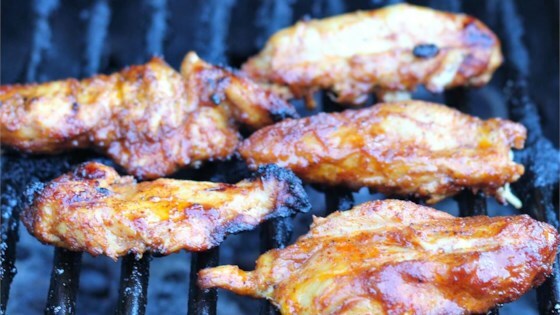 This marinade is wonderfully simple, but very flavorful. Yum!